Arabian Spirit has selected for you a set of leisure and activities that will amaze you as a couple or family. Complete tour of the great architectural achievements of Dubai. This tour offers you the opportunity to discover or perfect your knowledge on the development of the city and the construction of its unique towers. Even if architecture is not your cup of tea, the visit of this city where the excesses have no limits remains impressive. Dubai has become one of the main cultural capitals of the Middle East in recent years and has an impressive collection of contemporary art galleries. Our guide will accompany you in the discovery of the latest trends. Visit to the Women’s Museum in the Gold Souk district. Visit the museum of the poet A Oqaili in the spices souk district. Visit of the coin museum in the Al Fahidi district. Visit of the museum of Fort Al Fahidi and its building dating from the end of the 19th century. Visit the Al Fahidi Coffee Museum in Bur Dubai. Departure very early in the morning to follow the training of dromedaries racing in the desert directed by “jockey robots”. Followed by a short stop at the local market. On the way back, you will have the chance to observe pink flamingos off the “Creek”. You will then visit the falcon center and its small museum devoted to this famous bird of prey. It is here that the Emiratis come to buy their hawks in order to continue the tradition. Dubai residents invite you at their table in order to discover their way of life and thus to better understand this interesting Emirati culture. You will taste a baked “hamour” (the local fish) or another exotic dish of which only the house mistress knows the secret. During this meal, you will be the privileged guest of a francophone or anglophone family and share an unforgettable moment. Initiate yourself to the oriental fragrances. Meet a French-speaking Emirati and learn about the habits and customs around a cup of tea in her house. Combine wellness and discovery in the most beautiful spas in Dubai. Visit the private museum of the pearl and its jewels. Take advantage of our great shopping addresses and especially the sales of major brands. 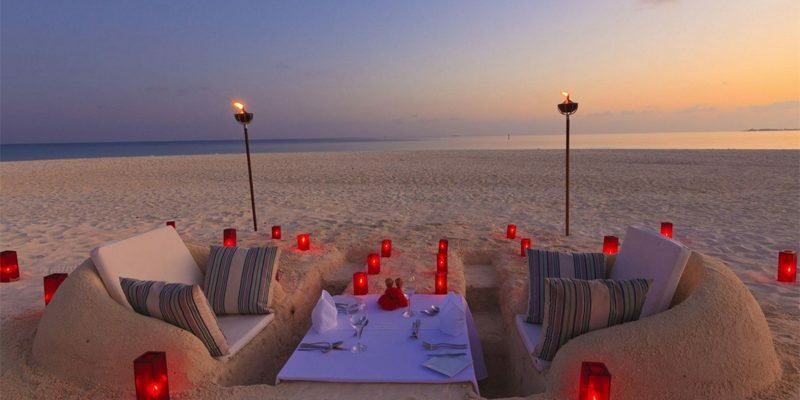 Magical and romantic evening in an intimate atmosphere. Perfect blend of luxury and exclusivity to surprise your partner and make this moment an unforgettable experience. Whatever the occasion, do not hesitate to indulge yourself! Enjoy a stunning mangrove ride on the shores of Abu Dhabi aboard a traditional wooden boat accompanied by an English-speaking guide. He will explain everything you need to know about pearl culture. Then, you will have the chance to seek for a pearl in an oyster. Start the day with a delicious breakfast buffet. Then go out to meet the horses, while visiting the backstage of a world-renowned equestrian center and enjoy watching the best racing horses in the world at training. This private, personalized shopping tour through Dubai will allow you to go beyond the traditional shopping malls to discover chic boutiques, traditional souks and other hidden treasures that will delight shopping enthusiasts. Wander through Old Dubai to soak up the perfumes which inhabit it. Discover the Middle East’s cultural heritage by strolling through these ancient quarters. Enjoy a traditional Arabian fruit cocktail accompanied by typical Middle Eastern amuse-bouche. Arabian Spirit offers its private villa rentals on the Palm Jumeirah, to make the most of your stay in the greatest of comforts. Our private residences have 4 to 5 rooms in suites, with digital TV and wifi. You will enjoy their fully equipped kitchens and their warm and innovative interiors. Also, treat yourself to a refreshing swim in their private pools and direct access to the beach. Your entire satisfaction being our primary goal, it is also possible to provide you with qualified house staff. Finally, our concierge service includes the complete organization of your stay, from your arrival until your departure.